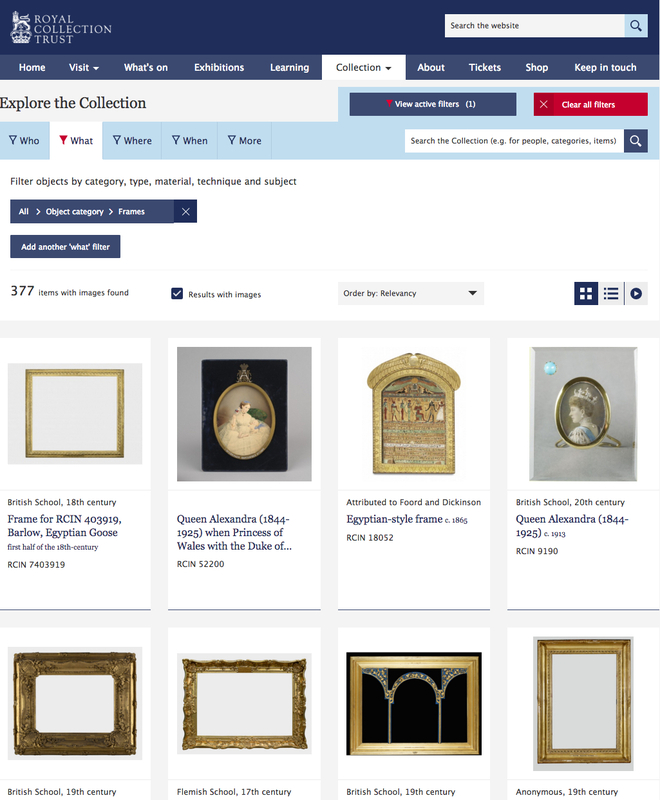 The website of one of the greatest art collections in Britain has just become even more interesting and exciting with the creation of a new category by which to search it: around four hundred images, descriptions and references for picture frames in the Royal Collection have recently been uploaded. This is a process which will be continuing through 2016, and will enable researchers to understand more of the effect of taste in different eras upon the paintings acquired by various collectors. 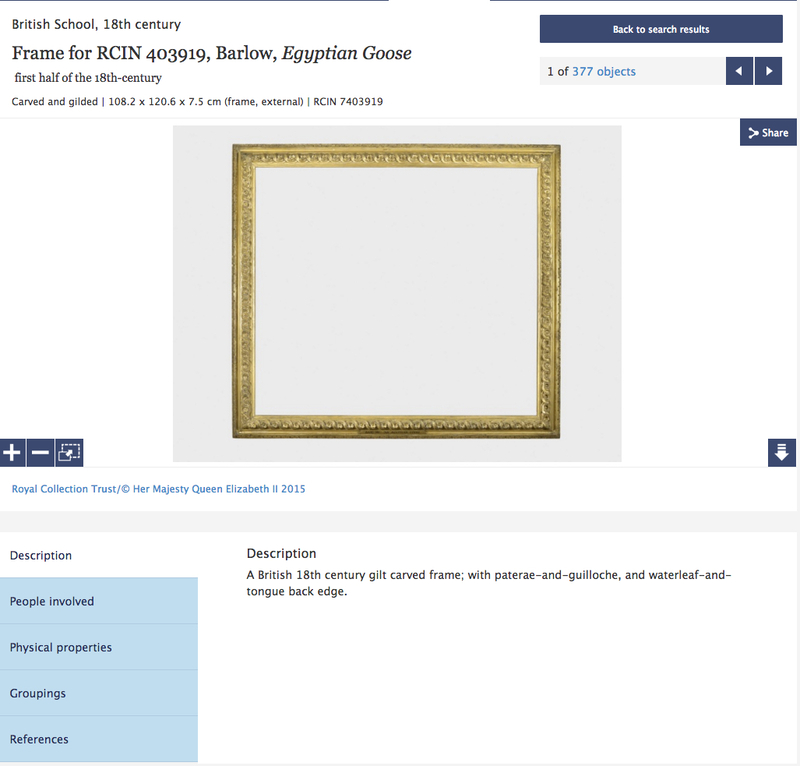 Like the similar undertaking by the Yale Center for British Art, this provides a model for other major museums and institutions across the world as to how their own collections of picture frames might be catalogued and made available online. The Royal Collection includes almost eight thousand paintings (including pastels and enamels), with acquisitions dating back to the reign of Henry VIII. Whilst the collection as it stood on the death of Charles I no longer survives (much of it having been sold during the period of the Commonwealth), subsequent royal collectors and patrons such as Frederick, Prince of Wales, Georges III and IV, and Prince Albert, have greatly extended it; and it comprises paintings by Mantegna, Titian, Lotto, Holbein, Rubens, Van Dyck, and Canaletto, amongst others; work by a whole raft of 17th century Dutch artists; and portraits by great British and Continental painters from the 16th century onwards. These are accompanied by more records than is true of many collections, including inventorial entries but also invoices and receipts, so that the trace of the framemaker associated with these paintings – although still sparse and arbitrarily preserved – is stronger than in general. The appearance of framed paintings, and their place in various hangings, have also been recorded since the early 19th century: Pyne’s History of the Royal residences (1816-19) accurately depicts picture frames in rooms throughout the royal palaces. For example, a Paul Petit frame on the portrait by Antoine Pesne of Frederick the Great can be clearly distinguished in the illustration of Queen Caroline’s Drawing Room, Kensington Palace (sadly this frame was later sold out of the collection) . Such a background makes the cataloguing of the royal picture frames peculiarly interesting, although the example above is an indication that original or authentic period frames may be few and far between. 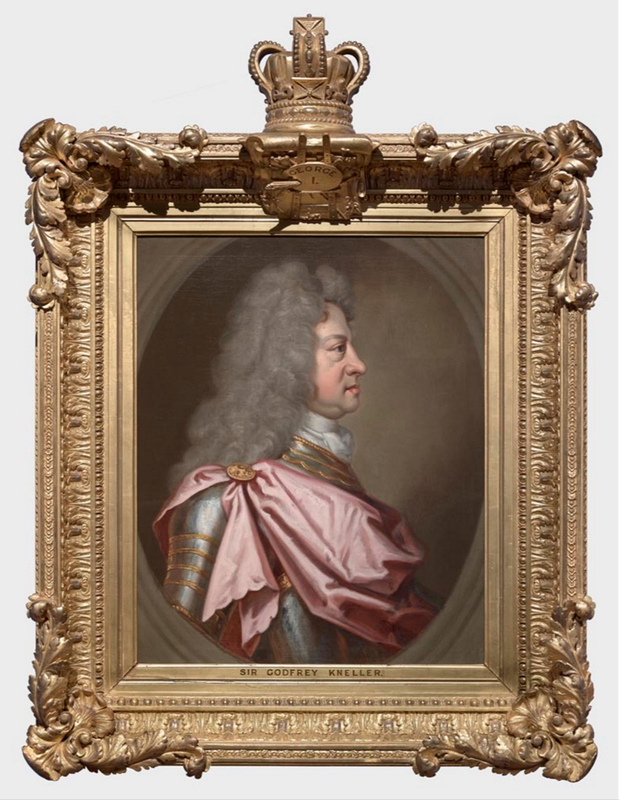 Prince Albert, for example, was responsible for reframing many paintings, and also for aggrandizing existing frames (for example, the 17th century carved frame on William Hanneman’s portrait of the Duke of Hamilton). The paintings associated with Henry VIII certainly do not promise many – if any – early examples (although the frames have not all, at the time of writing, been photographed and added to the website). 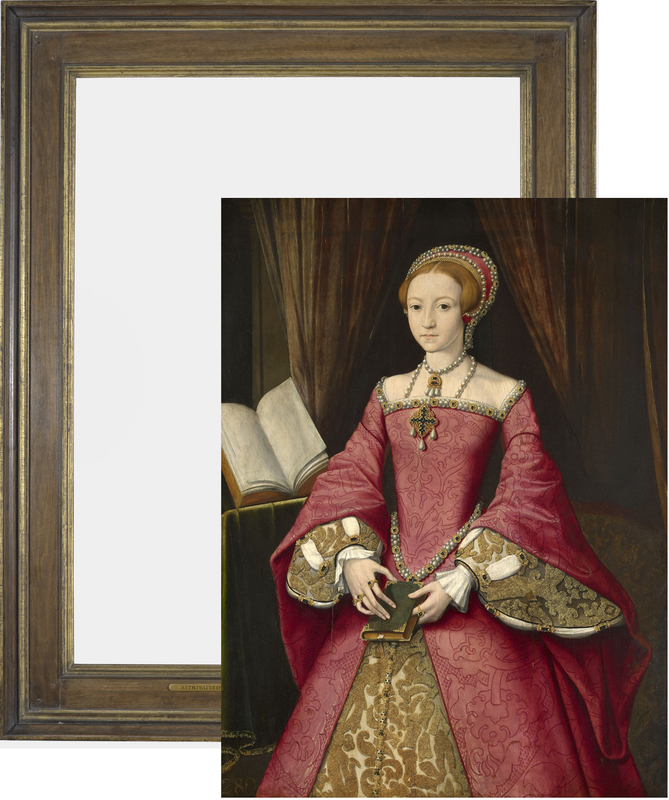 The portraits of his children, Elizabeth I and Edward VI by William Scrots, are both in reproductions of 16th century styles attributed to the 20th century London framemaker Paul Levi. The cataloguing process, has, in this incarnation, been continuing since 2014, although there have been previous attempts to record all the frames in the collection. At the moment, something over 3,000 have been dealt with. The descriptions are quite brief, and include nationality, age, materials and style, as well as ornamental details. It should be noted here that the ornament is described from the sight edge outwards to the back edge, since on The Frame Blog it is always described from the back edge inwards to the sight edge, as it seems more logical to arrive finally at the ornament nearest the painting – the reason for the frame. Photography of the frame and its contents has generally been undertaken separately, when the painting is being conserved, and sometimes because the work has been glazed for protection. This explains, in some part, the great proportion of images of empty frames which have been uploaded . All the frames and their records are accessed by going to the collections page of the website, clicking on the ‘What’ tab, and then accessing either ‘Object category’ > ‘Frames’, or ‘Object types’ > ‘picture frames’ (both have drop-down menus, although the first is short, and the second insanely long; it is also possible to type the category or type into the box). The result throws up, in random order, the ever-increasing number of frames uploaded, as can be seen. However, this screen shot also reveals the slight glitch in this extremely worthy project, which will, with luck, be ironed out later in its progress. It is immediately evident that this first group of frames contains both empty items (as just noted), as well as whole works of art in their settings; the top row, from left to right, shows the untenanted frame of Barlow’s Egyptian goose; a velvet ‘trophy’ photo frame holding a hand-coloured photo of Queen Alexandra; the Egyptian-style carved wood & gesso frame for an ancient stela given to the Prince of Wales in 1862; and a bejewelled glass frame for a miniature of Queen Alexandra. The last three of these have been photographed as single integrated works of art, so that the researcher sees immediately the painting/photo/antique fragment within the context of its frame; clicking on any of these thumbnails brings up the framed work on its dedicated page, as above, with the details of the frame accessible beneath it and the possibility of downloading a larger image by the arrow on the left. Clicking on the thumbnail for the Barlow frame, however, still leads to the record and image for that frame alone; save for the note of the artist and the title of the associated painting at top left, there is no indication of what should be inside it. If we wish to see the painting, we have to make a new search – preferably in another window; this is most simply done by using the accession number. This brings up thumbnails for the frame and the painting side-by-side; however, they are still separate, and are in as close a relationship as we shall be able to see them on the website. If we want to see the painting inside the frame, we shall have to download the individual images of each and combine them in Photoshop. 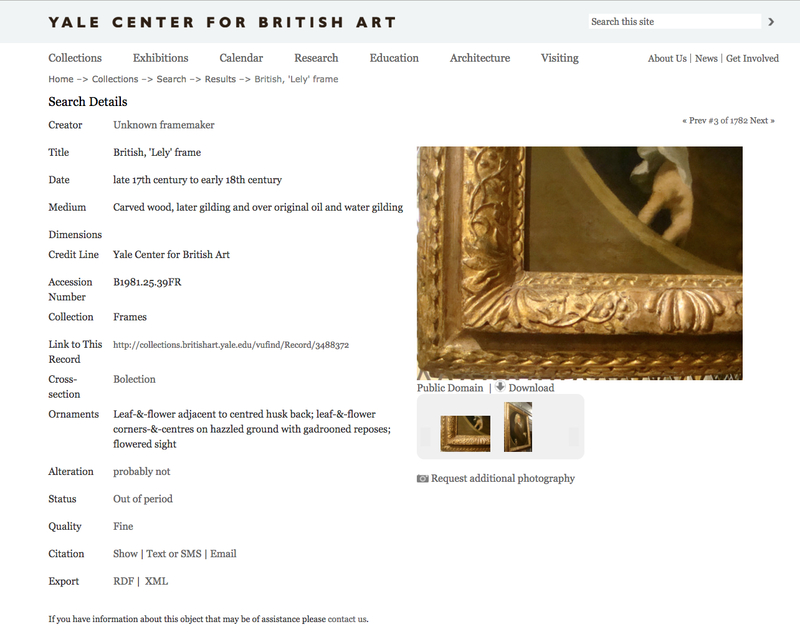 A related glitch still bedevils the online catalogue of the frame collection in the Yale Center for British Art, even though this project began in 2009, and was finished by 20013. Here, it is also possible to bring up thumbnails of the whole frame collection; clicking on one of these will open the record of the frame, along with further thumbnails of the framed painting – so that at least we can see the whole work of art. 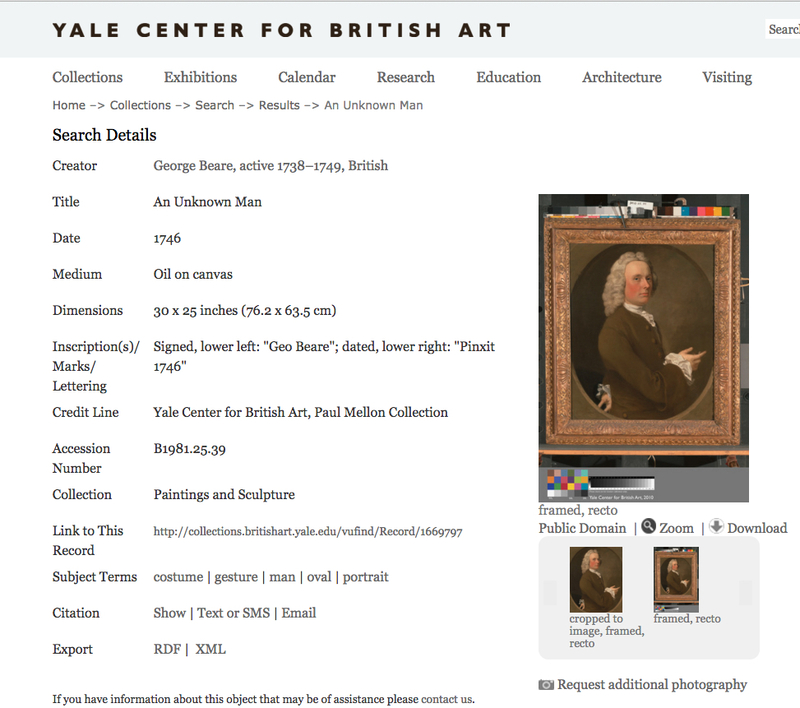 However, in this case, there is no indication whatsoever as to what the painting is or who the artist might be; so, unless the painting is so famous as to be recognized, or unless another search is performed in the paintings collection (again, most simply by using the accession number, without the frame ‘FR’ suffix, in a new window), what is shown of the frame in its own record does not appear to have any outward connection with an exhibit within the museum, and is thus of limited interest as to the Paul Mellon collection itself. It is only by knowing what this frame holds that the relationship between setting and painting is brought to significant life, and an implied history of artist and framemaker, or of collector and decorative taste, is opened. Having accessed the painting record, there is certainly an image there of the frame: however, there is also no longer any way to read about that frame, or to see close-up details of its decoration, without returning to the specific frame record. With respect to the Royal Collection, if a painting record has been accessed and we also want to see its frame, it is possible to find this by adding a ‘7’ in front of the accession number: i.e. the number for Barlow’s Egyptian goose is RCIN 403919, and for its frame is RCIN 7403919; however, both records will still need to be opened in separate windows. Until those who are organizing these praiseworthy projects are given more sense of how the information they are uploading needs to be accessed by art historians, there will inevitably be these blockages in the various currents of information. 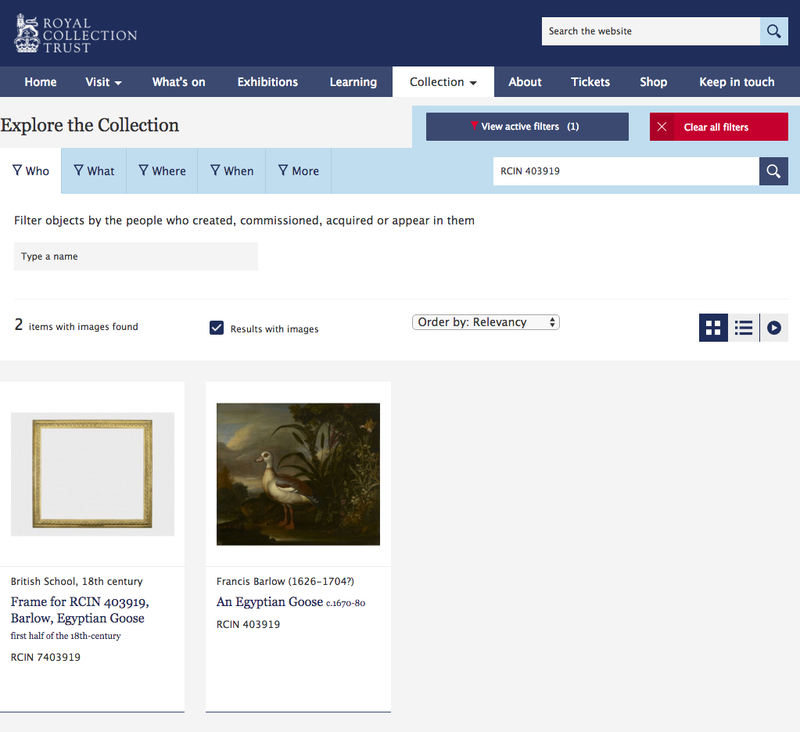 However, related blockages in two very similar cataloguing ventures is slightly worrying – particularly when it is so very easy to create live links on every page as the process is happening, and thus to tie painting and frame records closely together; and when it is almost equally as easy to Photoshop a painting into an empty frame. Such auxiliary activities are far less likely to be undertaken when the main project has been completed. 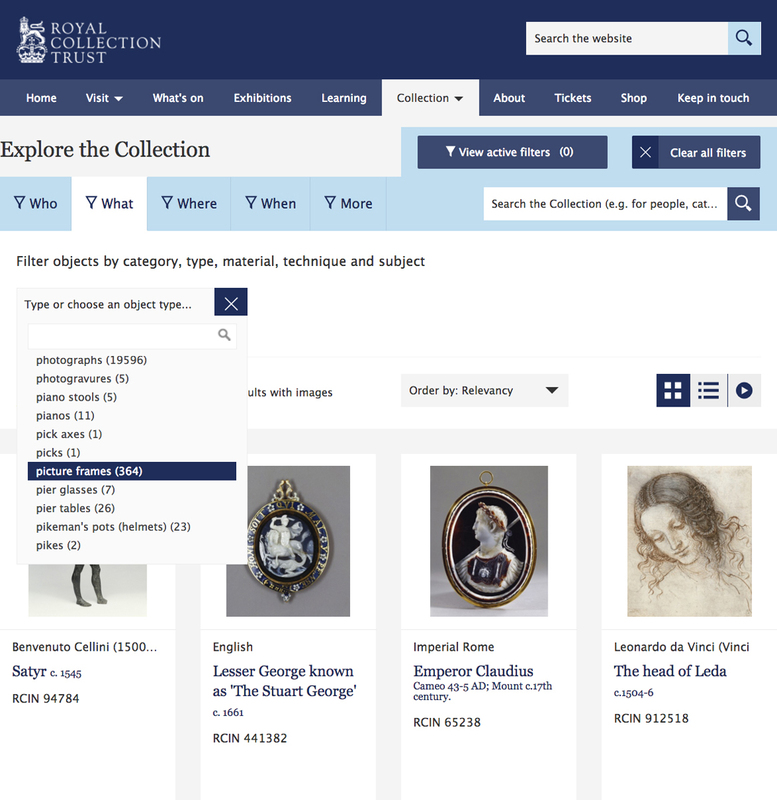 Excepting this flaw, the project of making all the frames in the Royal Collection searchable and giving them downloadable images is more than worthwhile, and otherwise very successful. 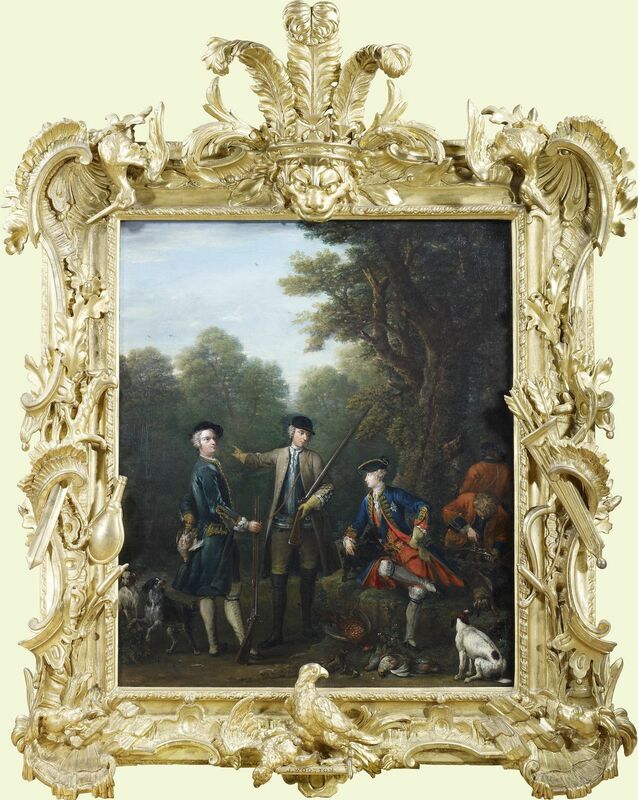 It is immensely satisfying to be able to see online at last major pieces of sculpture such as this example of a Paul Petit frame, carved for Wootton’s The shooting party to the order of Fredrick, Prince of Wales, and still surrounding the work it was made for. (Here the painting has been photographed in its frame, and so the records of each are, as they should be, connected – at least through this image). The intricacy and grandeur of this piece reveals the prince to have been not only a substantial patron of British Rococo painting, but of the even more impressive skills of the carvers – frequently of French Huguenot extraction – practising in Britain in this style. He paid Petit £21 for this frame, which was described as a ‘Rich picture frame Carved with birds Richly Ornamented Neatly repair’d [i.e. recut in the gesso before gilding] and Gilt in Burnished Gold to a picture of His Royal Highness painted by Mr Wootton’ . 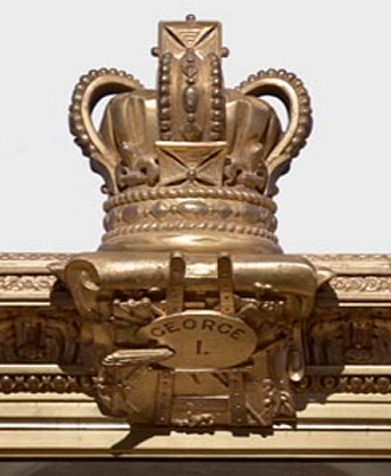 Searching for ‘Paul Petit’ on the website will now bring up both this trophy frame, and the Royal Barge designed by William Kent , which Petit painted and gilded. A frame which is interesting for entirely different reasons is available early in this first tranche of images (and can be seen in the second screen shot, above). 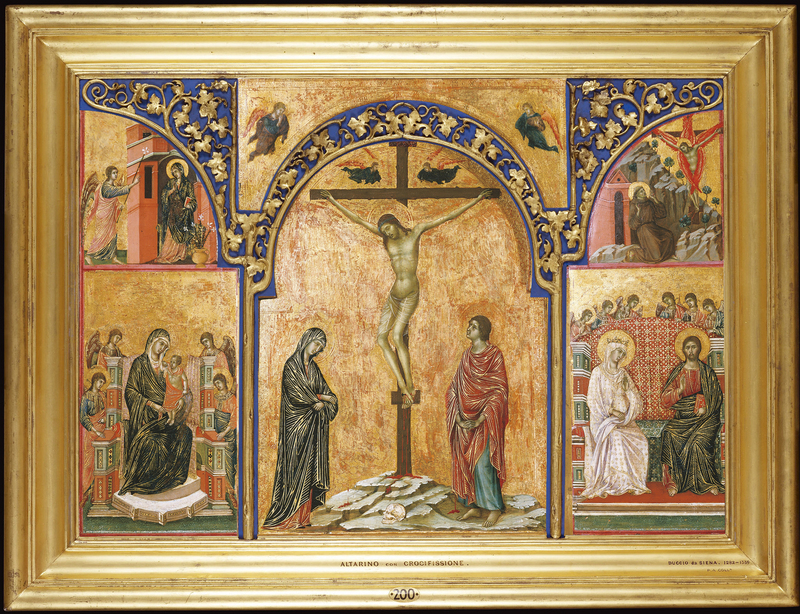 This is the frame which Prince Albert caused to be made for Duccio’s Triptych with the Crucifixion, which he had bought in 1845. The record for the painting (again, a separate search must be made for this) reveals that the triptych had been taken apart before the Prince acquired it, the wings unhinged and the three panels assembled as one – which explains the Victorian frame, with its internal, revival Gothick decoration designed to cover the joints of the separate pieces. 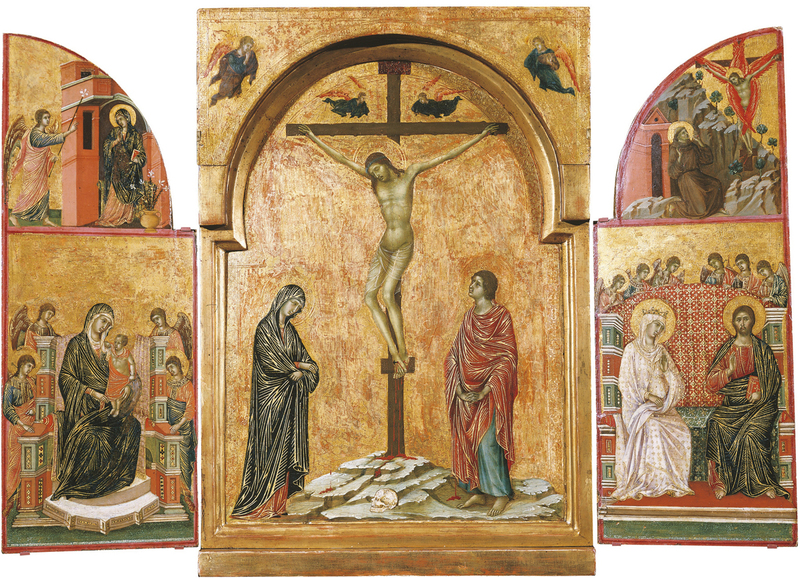 The triptych has since been restored and reassembled as an altarpiece with hinged shutters, so that it would not be possible to photograph it inside the Prince’s frame; however, the combination reveals something of Victorian taste, and of the steps 19th century collectors took to provide what they saw as appropriate settings for early Italian art. 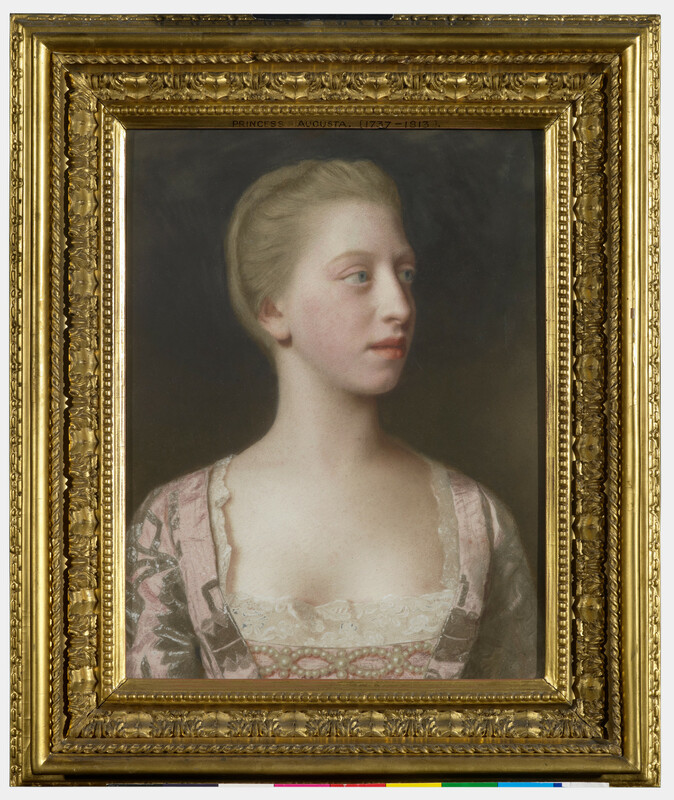 It is only too tempting to do what the Royal Collection website might consider (given more time and investment) doing, and digitally reconstitute the two pieces, if there is no other photograph. 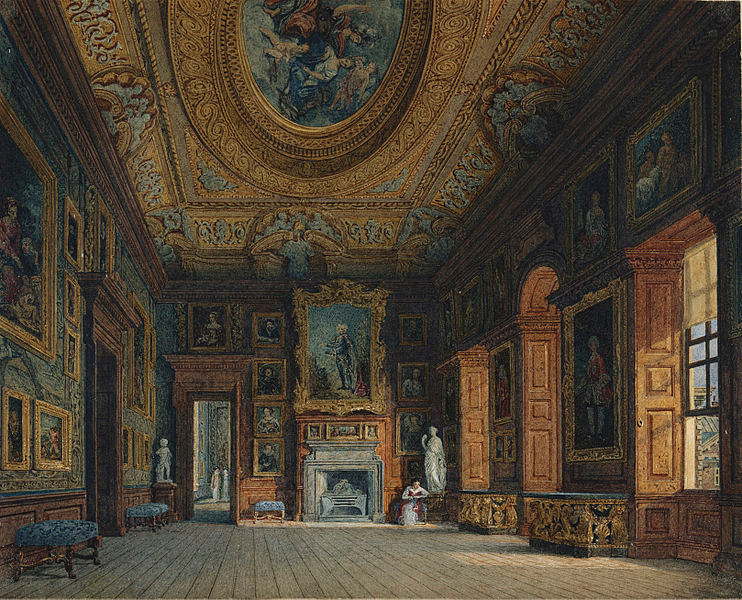 The Photoshopped image makes immediate sense of why the outer ‘Maratta’-style frame is so wide and chunky in comparison with the delicate internal divisons; Prince Albert liked large frames, to give presence and authority to his paintings, and the combination – for the time and circumstances – has an architectural heft, and is unexpectedly, if anachronistically, effective. 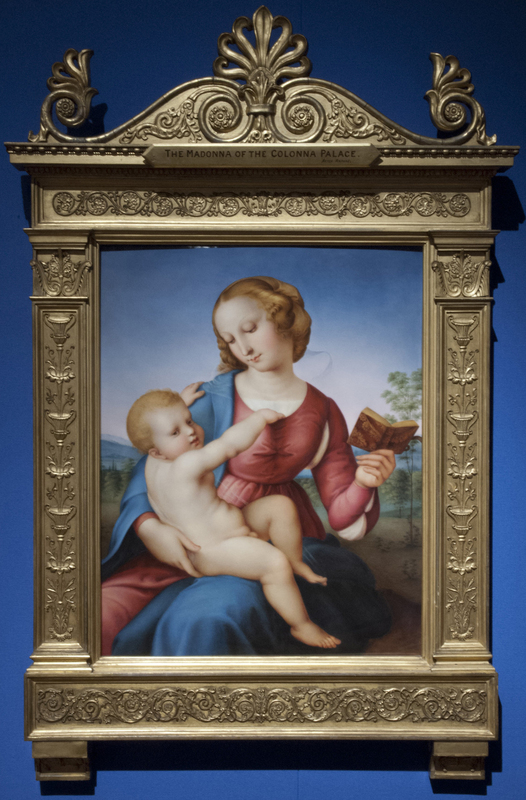 A similar Renaissance-revival style confection still holds the copy on porcelain of Raphael’s Colonna Madonna; this was framed in Germany, in the mid-19th century, before it was acquired by Queen Victoria and Prince Albert; and since the porcelain plaque and the frame are, as it were, coaeval, it is entirely appropriate that they should remain together. In this case, the name of the German framemaker is also known, although we have no details beyond his name and address. Having a large selection of frames collected in a general search is an invitation to play with the empty examples, and to put them together with their paintings. 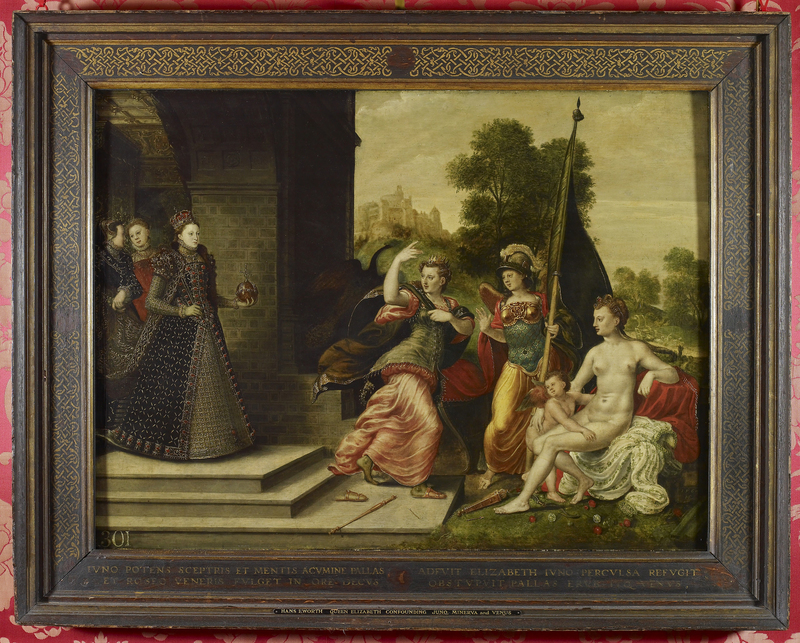 For example, the charming Venetian Rococo frame of Ricci’s studio painting, The family of Darius before Alexander, which is only slightly later than the picture, and perfectly complements the style of the painting. This is an ogee panel frame, with unusually elaborately-shaped reposes (or mirror panels) between the carved and punched corners and centres, with their scrolling and undulating leafy tendrils. It is attributed to the ‘Masters of the Consul Smith picture frames’, a mediaeval-sounding appellation which refers to Joseph Smith, the British consul in Venice during the mid-18th century, who beguiled his ambassadorial and banking career there by patronizing Canaletto and collecting a variety of art and other objects. 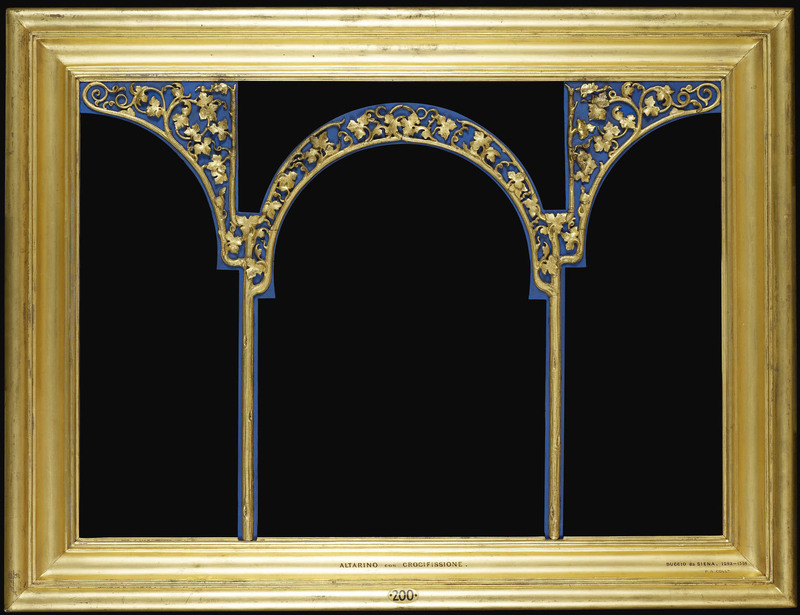 Much of his vast collection was eventually sold to George III, which explains the number (at least 28 so far) of frames in similar or related Venetian designs by these framemakers now in the Royal Collection. Some of them are connected with Dutch paintings, which is rather less appropriate, but there are several more on works by Ricci and his studio, and by Canaletto. Frames which have been photographed – like that by Paul Petit – on the paintings they surround, include the ‘Maratta’ frames made for Jean-Etienne Liotard’s pastels of the royal children of Frederick, Prince of Wales (for which see Liotard…). These are well-carved and nicely detailed, and a receipt exists for some of them – although sadly not identifying the maker. 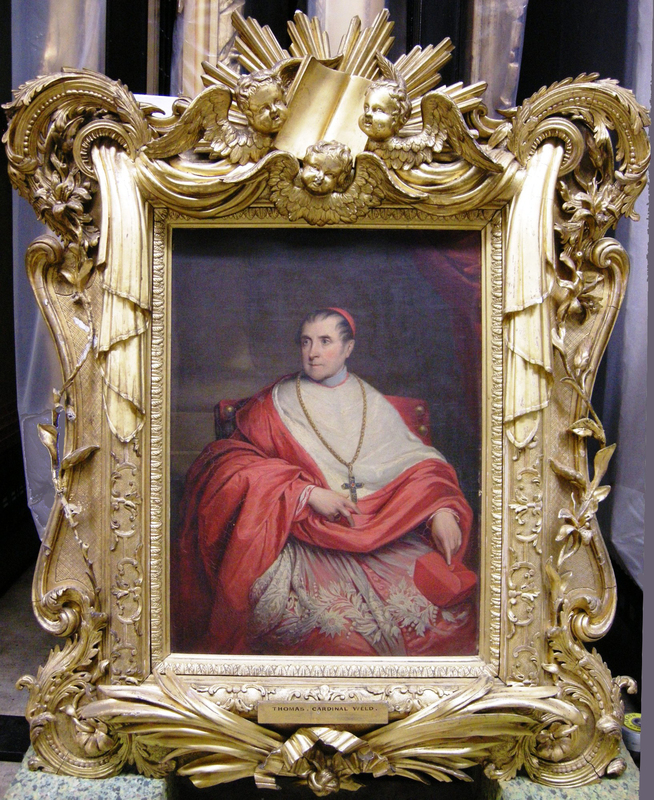 A rather more extraordinary example is the large Victorian trophy frame on the portrait of Cardinal Weld, painted in Italy between 1829 and 1837. It is an amalgam of styles, including, from the outside, a revival Rococo-style structure, a wide frieze of Marot-like ornament, and a NeoClassical feather-tip sight edge. To this have been added draperies swagged from the top corners; a sunburst, Bible and three supporting cherubs’ heads at the crest; and two bunches of ribbon-tied palms at the base. Undulating sprays of lilies meander up the sides on compo-coated wire supports, now rather the worse for wear. The maker is given as Richard Abraham of 8 Bruton Street, Berkeley Square, although it is not clear as to whether this information comes from a label on the frame or a record such as an invoice. If the former, there should be a caveat entered that he may have been concerned with packing the work, or with repairing the frame if it had actually been produced in and travelled from Italy. However, Richard Abraham seems to have been a Catholic and thus was eminently suited to framing portraits of cardinals, since he appears in Dolman’s Catholic Directory… for 1838 and again for 1840 as ‘Carver, gilder, decorator, house painter, and paper-hanger’. 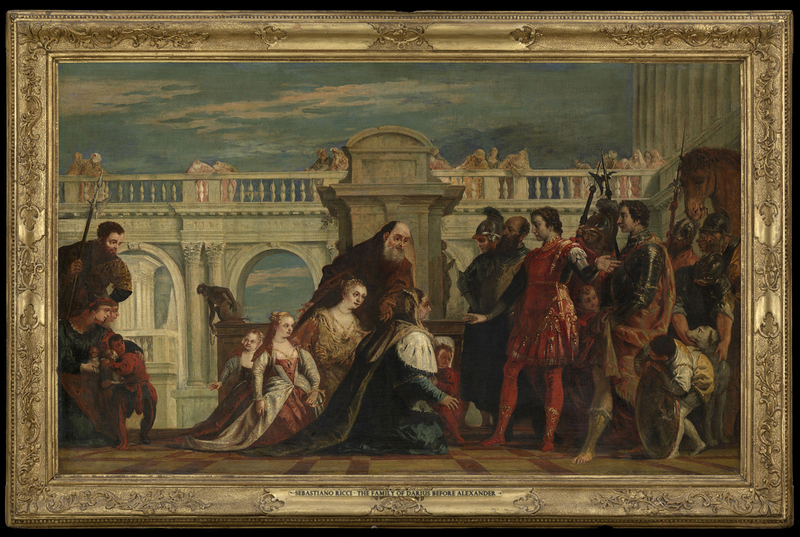 The painting is in its original frame which has the contemporary inscription: `IVNO POTENS SCEPTRIS ET MENTIS ACVMINE PALLAS / ET ROSEO VENERIS FVLGET IN ORE DECVS / ADFVIT ELIZABETH IVNO PERCVLSA REFVGIT OBSVPVIT PALLAS ERVBVITQ VENVS’; which translates as: ‘Pallas was keen of brain, Juno was queen of might, / The rosy face of Venus was in beauty shining bright, / Elizabeth then came, And, overwhelmed, Queen Juno took flight: / Pallas was silenced: Venus blushed for shame’. The rest of the frieze is ornamented with a complex gilded pattern of interlacing, based on the patterns of geometric ‘knots’ which became popular as mathematical puzzles during the late 15th century, and examples of which were produced by Leonardo and Dürer. Related designs, such as those by Francesco Pellegrini, were used as patterns by lacemakers and goldsmiths, making this decoration eminently suitable for the picture of a 16th century queen. It appears originally to have been interrupted along the frieze by a number of applied bosses (oval at the corners and circular at the centres), which have since been lost. These might possibly have been carved heads of amorini or gilded apples; they might also have held heraldic crests or coats of arms. 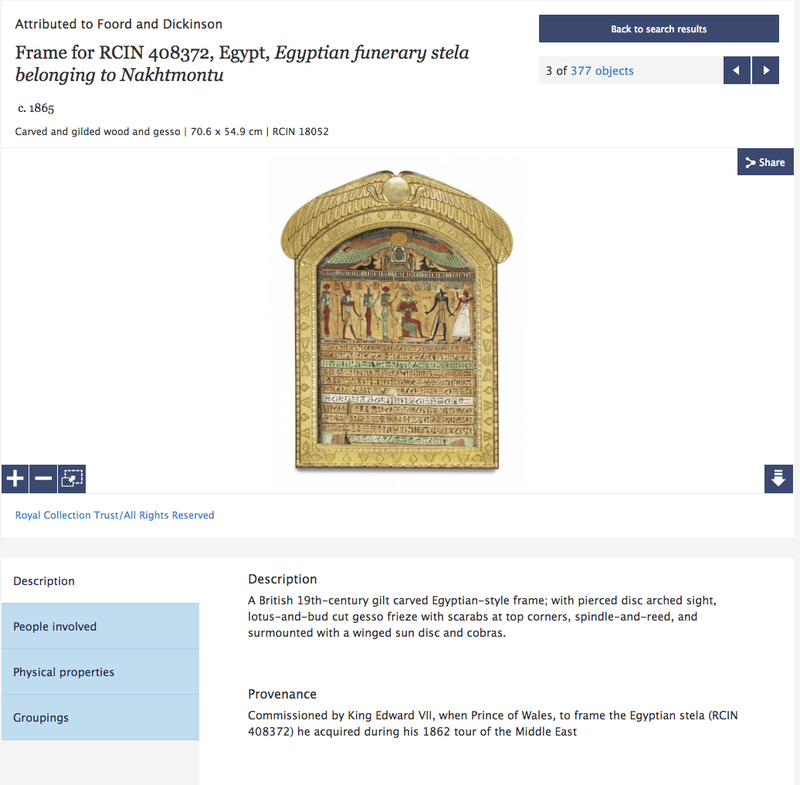 In its way, this is as magnificent a frame as the gilded sculptures of Paul Petit, and demonstrates the quality of some of the lesser known treasures in the Royal Collection, which this project to upload the royal frames is slowly revealing. On one matter of detail, Oliver Millar in his catalogue, Tudor, Stuart and Early Georgian pictures, page 149, records that John Smith sent in his account for £75.12s on 20 January 1812, for ‘superb Frames… for the portraits of George the 1st & second’. Like so many things in the royal collection, the story is complicated. The frame was swapped from one version of the picture to another. This is a slight hint that perhaps one or two errors may have crept unavoidably into the frame descriptions along the way. The frame of Kneller’s portrait of George I, RCIN 403401, is described as ‘late 18th century’, and is attributed to John Smith. However, this is a later, Regency design, probably of the 1810s or even the 1820s; and since John Smith wasn’t born until 1781, and didn’t complete his apprenticeship until 1801, he was unlikely to have been making frames for the royal family in the 18th century. He was appointed the king’s framemaker in 1812, so, if there is a label or invoice connecting this frame with Smith, it is likely to have been made after this date.